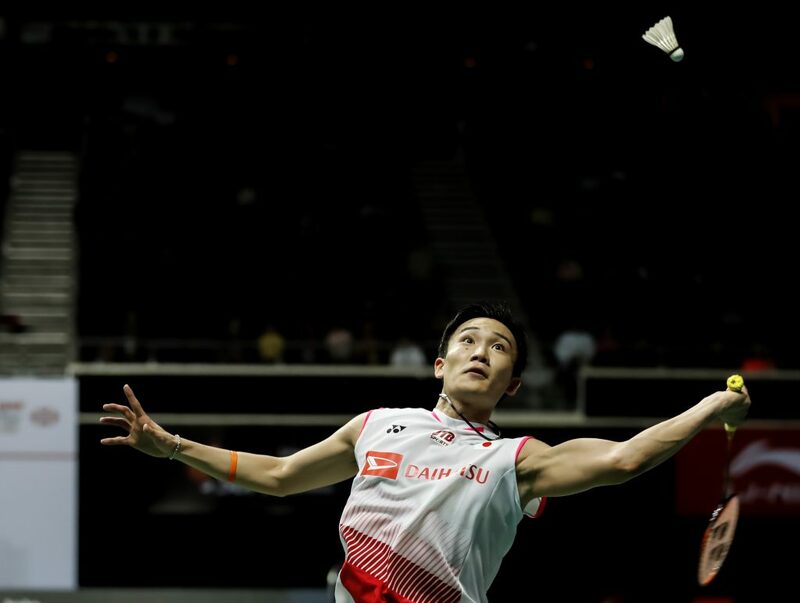 Favourites Tai Tzu-ying (above) and Kento Momota once again claimed titles at the Singapore Badminton Open. The annual tournament holds a special place in both the world No. 1s’ hearts since it was in Singapore that their badminton careers kicked off. The 4,962 strong crowd at the Singapore Indoor Stadium were not disappointed on Sunday (April 14, 2019) as they were entertained by the exhilarating action. Women’s world No. 1 and top seed Tai Tzu-ying (TPE) reclaimed her title when she beat second seeded Japanese Nozomi Okuhara 21-19, 21-15. Returning to Singapore sparks fond memories for Tai who entered her first senior tour final at the Singapore Open when she was just 16. She had won the Malaysia Open last week. “It has been awhile since I last played Okuhara. I knew that she is an attacking player, so it wasn’t easy for me to play against her. Because her movements around the court were very fluid, I was prepared to run a lot today, just like I did last night when I played against Yamaguchi,” said Tai. “I put the pressure (because I haven’t played with her for so long) upon myself, so I was thinking too much. Before coming to this Singapore Open, I had to prepare, because my opponent is very skillful and tricky, that’s why I need to be careful and wait for her to hit (because Tai’s shots are unpredictable),” said Okuhara. Momota’s dream run at the Singapore Open continued as he bounced back after losing the first game to Anthony Sinisuka Ginting (INA) 21-10. The world champion eventually proved why he is such a force in the badminton world when he won the second and third games 21-19, 21-13. This is his second Singapore Open title, having won it in 2015. “Today I thought I was going to lose. The opponent had better quality than me, but maybe Ginting has played many matches so he was tired, that’s why I had the opportunity to flip the points over. “I won my first title in Singapore so from then on my attitude towards winning has changed. I am very happy and pleased about my win today. 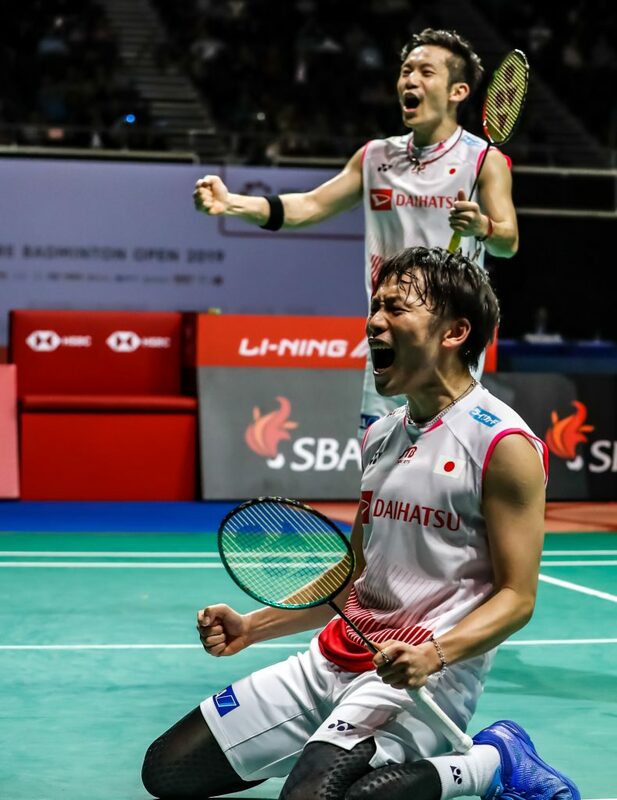 Singapore is something special to me,” said Momota (above). “I was controlling well in the first game. In the second game, I was leading and the points were tight. I needed to attack more but Momota already anticipated my play and he managed to get points from me,” said Ginting. Momota’s Japanese compatriots also emerged victorious in the men’s and women’s doubles. World champions Mayu Matsumoto (JPN) and Wakana Nagahara (JPN) struck gold again as they trumped Korean pair Kim Hye Jeong and Kong Hee Yong 21-17, 22-20 in the women’s doubles final. This is the first time the pairs have faced each other during a competition. “The wind was against us, and the opponents did more attacking. In the end, we could adjust, but we talked to each other in the crucial moments, and so we agreed on what to do and just focused,” said Matsumoto. 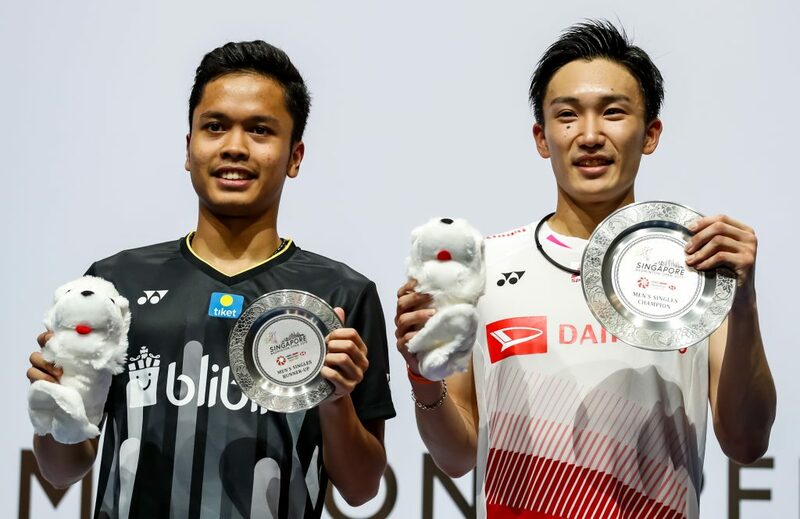 In the battle between third and fourth seeds, Takeshi Kamura and Keigo Sonoda (JPN) dethroned defending champions Mohammad Ahsan and Hendra Setiawan (INA) in a thrilling men’s doubles final. They won 21-13, 19-21, 21-17. “We really wanted to win, so we could only think about how to win each point, one step at a time. This win has really given us a lot of confidence and we are ready to go to the Sudirman cup as the ace pair,” said Kamura. “We managed to get into the spirit and in the third game the opponents were more ready and they played better,” said Hendra. Thailand’s Dechapol Puavaranukroh and Sapsiree Taerattanachai comfortably beat Tan Kian Meng and Lai Pei Jing from Malaysia to become the mixed doubles champions. The Thai duo won 21-14, 21-6. “I feel very happy and excited. Today, we just played our best and there was no pressure. We Concentrated on our game,” said Taerattanachai. “Today ouropponents played really well and at the same time we played not as good. able to make it to the final,” said Lai.